MediaSorter. All in one place. Everything sorted. Whom is the MediaSorter suitable for? You have photos and videos on different hard disks and/or USB sticks? You have photos scattered in different locations and folders? Maybe also many duplicates? You have photos of different camera models having all different file names and you want to sort all these photos and want to have them in a chronological order? Then the MediaSorter is definitely the best choice for you. The MediaSorter copies your media files (photos and videos) from one location to another and while doing that it sorts the files into a predefined folder structure. Files with the same content are copied only once, to prevent duplicated files. The date and time needed for the sorting are extracted from the Exif-Metadata of the particular file (recording date of the camera, if there is any), otherwise the creation date or the modification date of the file is used. All copied files get a new unique name, resulting in a chronological order when being viewed in the Windows Explorer (which uses an alphabetical sorting by default). You can define whether and how subfolders should be created: per year, per month or per day. You can select whole drives or USB sticks - all relevant photos and videos will be found. The MediaSorter is also very useful to create a backup of all your photos and videos on a new drive (hard disk, USB stick). The software is totally free! Just for information: Existing files remain unchanged! Photos and movies are only copied to a new directory. When sorting the files, the recording date of the photos is used, which is saved in the Exif-Metadata. If this date is not available, then the sorting is done with the creation date or modification date of the file. To make sure that all files have a consistent form and are sorted correctly in the Windows Explorer, each file gets a file name containing the particular date and time. Thus, also photos of different camera models, which are usually having different names, are sorted in the right way in the Windows Explorer (when using the alphabetical order). i.e. date + time + counter to prevent identical file names. You can decide how the subfolders are created. Subfolders per year, per month or per day. If a file was already copied with exactly the same content (for example if there is a duplicated file with a changed filename), the file is not copied again. Hence, unneeded files will be sorted out. You can decide which file formats you want to copy. The software can be started out of the box, without installation or admin rights. 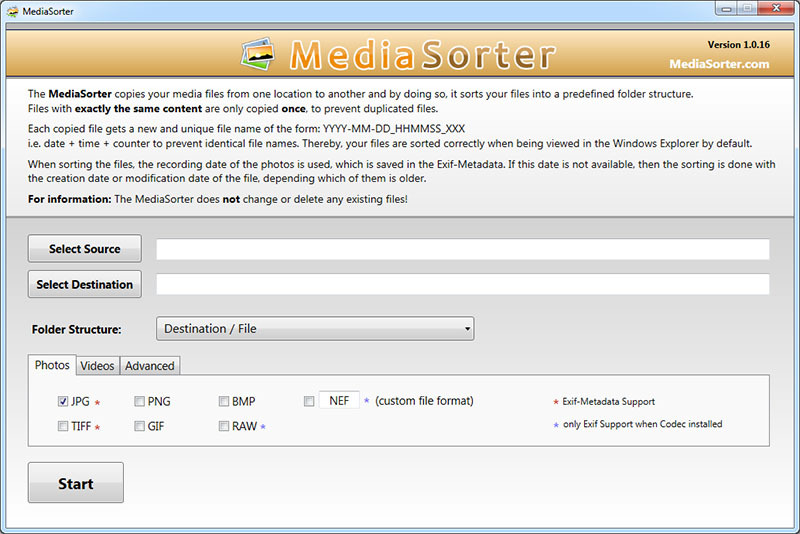 The MediaSorter does not change or delete any existing files! Instead the files are only copied into a new folder. If you are not satisfied with the result, just delete the newly created folder. The software itself does not need much space, in fact less than 100KB! Copyright © MediaSorter.com, 2015-2019. All rights reserved.